PHUYUWASI, Bolivia, Jun 7 2017 (IPS) - In this remote highlands valley community in central Bolivia, a group of Quechua indigenous women have learned how to combat the intense frosts and the shortage of water in solar tents, and to use what they grow to prepare nutritious new meals for their families. In Phuyuwasi, in the central department of Cochabamba, in a landscape dominated by vegetation resistant to low temperatures, Maribel Vallejos told IPS how the project involving family gardens in greenhouses has changed her life and those of other women in the community. 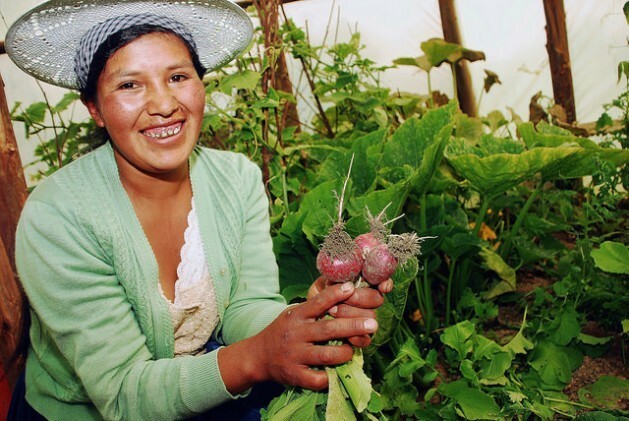 “I used to buy vegetables for 100 Bolivian pesos (about 12 dollars), but now I save that money,” said Vallejos, the only participant in the project who speaks Spanish as well as their mother tongue, Quechua. This village ino Pocona, one of the 46 municipalities of the department of Cochabamba, is benefiting from a programme run by the Ministry of Rural and Land Development, with the support of the United Nations Food and Agriculture Organisation (FAO) and other U.N. agencies. After two years of skills training, “there is no more (child) malnutrition. We used to not eat well, now we eat clean and we know what we are eating. We are stronger eating these vegetables,” said Vallejos. Although the surrounding fields are green, with oats and potatoes growing in the fertile soil, it is not easy to produce crops in these Andean region valleys as temperatures can drop abruptly to four degrees Celsius at night before soaring to 28 degrees, the project coordinator in Cochabamba, agronomist Remmy Crespo, explained to IPS. Experts from several disciplines arrived at the municipalities of Pocona and the neighbouring Pojo, where the local population lives in scattered villages and hamlets, to provide integral support ranging from food production, transformation or commercialisation to consumption, said Abdón Vásquez, the programme’s national coordinator. When the extension workers arrived in 2015, the local diet consisted mainly of rice, eggs and occasionally chicken. Today the daily intake of the members of the families involved in the project has increased by about 800 calories in proteins, vitamins and minerals provided by the vegetables they grow, said Crespo. Jhaneth Rojas, a young farmer from Phuyuwasi, described to IPS how much her family’s dietary habits changed, as she pulled red radishes from the dirt and showed them to us with a smile. 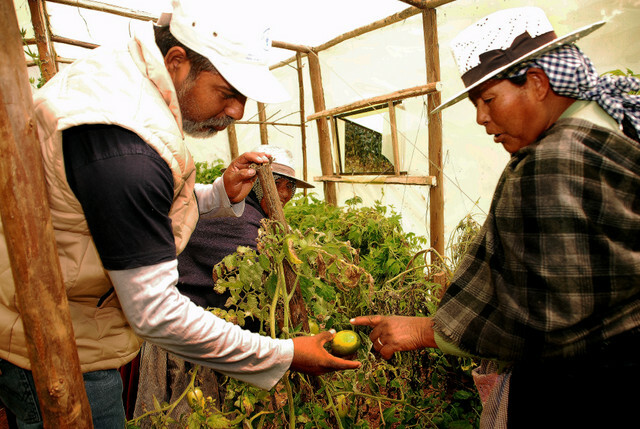 Local farmers did not used to grow radishes, beets, cucumbers, squash, green beans, broccoli or spinach, but today “my father is interested in expanding the solar tent so that his children grow strong” with the production and intake of vegetables, said Rojas. The project began in this village of 102 families in February 2016 with six tents, and today the community grows vegetables in 28 solar greenhouse tents. Communities in Pocona, with a combined total population of 14,000 people, asked for technical support and supervision to build another 36 greenhouse tents, which protect the crops in a temperature-controlled environment. 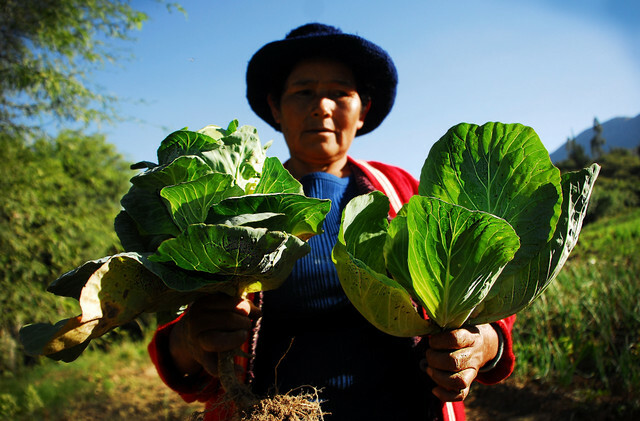 In the village of Conda Baja, Elvira Salazar shows us her small garden, with lush green lettuce, green beans and beets she grows to feed her family. Close to her garden, several fish farming ponds appear to be empty, but on closer look, carp (Cyprinus carpio) fry can be seen swimming in the one-metre-deep water diverted from the mountain slopes. The fish have also been incorporated into the diet of the village’s 99 families, said Luis Alberto Morales, who together with his wife Zulma Miranda enjoy the taste of the fish. Every 100 grams of carp provide 120 protein-rich calories, as well as vitamins A, B2, B6, B12 and E, iron, potassium, magnesium and phosphorus. Harvesting the fish is a festive event. The fish farmers invested around 150 dollars in each 10 X 10 metre pond, and received intensive training sessions in fertilisation of fish, raising fish fry, water oxygenation, water quality control and feeding. 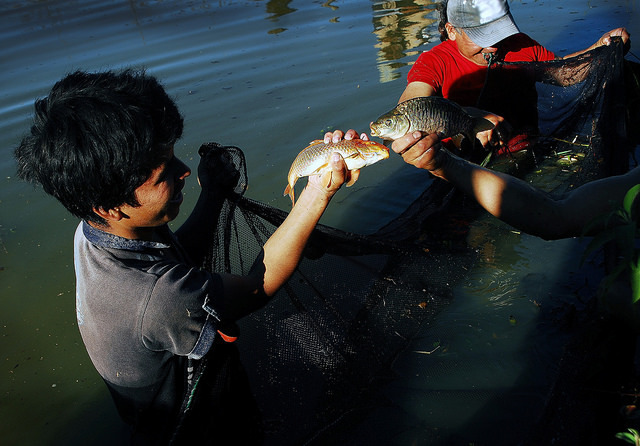 A total of 224 families from the municipalities of Pocona and Pojo (which has a population of over 10,000), have ponds populated with fish brought from the southern department of Santa Cruz. In addition to fish, FAO added the production and consumption of the meat of guinea pigs, an Andean rodent smaller than a rabbit, which produce an average of 30 offspring per female annually. Daly García told IPS that the nutritional quality of guinea pig meat motivated her to build breeding pens. On her two-hectare family farm near Pojo, the seat of the municipality, 200 km from the city of Cochabamba, she now breeds guinea pigs using the fodder and alfalfa that she herself grows. She also produces apples, peaches and other fruit. Farther from Pojo, at 3,300 metres above sea level, on the slopes of the mountains surrounding the village of Villa Esperanza, Clemencia Zapata tends her 1.5-hectare plot. Every morning she climbs a path to her land, where lettuce, cabbage and maize grow in neat rows. The crops, growing under the bright sun of the Andes highlands, need assistance to combat pests, Zapata explained to IPS. FAO agronomist Miguel Vargas brought containers with “bio inputs” which replace agrochemicals. Bolivian Entrepreneur Helps Quinoa Shine in U.S.
Bio inputs have the technical support of FAO, the German Technical Cooperation Agency (GTZ) and the Andes Agrecol organisation, in addition to the Pojo city government. The products have been widely welcomed by the 150 people who have used them to replace agrochemicals, which they blame for health ailments such as eyesight problems and damage to the nervous system. The project sells the bio inputs to farmers, at cost price, using the income to expand the production and benefits to other producers. The last link in the project’s chain is the Healthy Products Processing Plant, inaugurated on Apr. 21 and headed by the Pojo Association of Producers of Nutritious Food. Like the solar tents, the facilities and brand have a female face. Teacher Cinthya Orellana and producer Zaida Orellana direct the activities, under strict quality and hygiene control. The food must be boiled for 20 minutes and served hot, they recommend. A nutritious soup of corn, vegetables and jerky or dried meat, or vegetables combined with fava beans, are among the dishes offered at local trade fairs. “Men are not interested, that’s why all the partners are women,” said Orellana, a young woman who left the textile workshops of Argentina and Brazil to return to her land to look after her husband and children and work in the industrial processing of food products in Pojo. How wonderful this has come about in today’s world. The idea that this agricultural ability found its way to Bolivia, is a testament to the good that humans to humans can produce.